Something unexpected happens at lunch sometimes. One question leads to another and soon revelations are made. This really should be an essay about my cousin Lee, but it’s also a story about our grandparents. Unlike many kids from divorced families I saw my dad every weekend, and because he lived on the same piece of land as my grandparents, I saw them as well. On Saturday mornings I would run from my dad’s house to my grandmother’s house, wearing nothing but my dad’s long t-shirts that I loved to sleep in. My grandmother and I had never been close. She wanted to dress me up in frilly dresses and play with dolls. I wanted none of it. But she did teach me to sew. That was where we found our common ground. On Saturday mornings she would make biscuits and I would sit on her floor watching cartoons and cutting out squares that would eventually become a quilt. Raised in rural poverty during the Depression she knew all too well what it was like to go to bed hungry. She tended her garden and hoarded her bounty in mason jars that lined the garage. As a child, my father always warned me not to eat anything that came from those jars. They sat on the shelves like specimens to be studied but not touched. Then there was the money she hid around the house because banks couldn’t be trusted. She also hoarded fabric, which was stacked floor to ceiling in her bedroom. For most of my childhood my cousin Joel, who was two years older, spent Friday nights with us. He was an only child as well. I got a playmate and his parents got a night out. We climbed trees, built forts, played in creeks, made mud pies, and did a whole host of dumb stuff that could have easily gotten us killed. I was riding three wheelers before I could ride a bike. 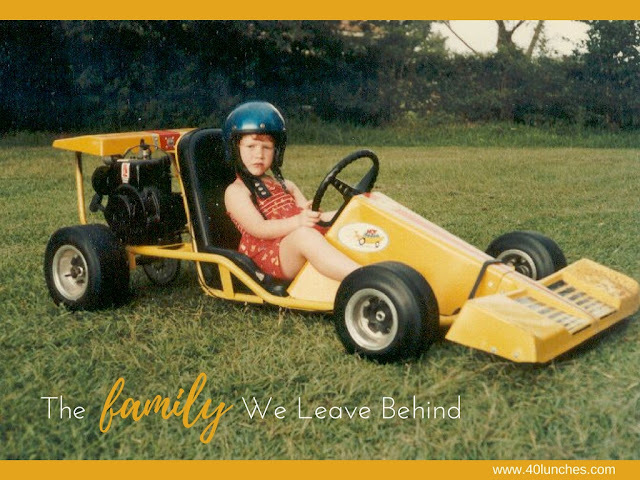 Eventually I graduated to my own go-cart, a bright yellow model with a formula racing body called “The Hot Banana”. (I’m not kidding.) In one near-death experience I ran my cousin’s go-cart, which had hand breaks that my small hands couldn’t reach, into a steel wood splitter, taking most of the skin off one side of my face. When I finally woke up my first words were, “Mama’s gonna kill daddy.” Joel and I could easily spend the day outside without once being called inside. It was the kind of childhood that is rare to find these days. There was also my cousin Lee. His parents were divorced; his mother lived in town and his father lived in Florida. For most of my childhood Lee was shuffled back and forth between parents, grandparents and other relatives. Because he was a little older he wasn’t always interested in our adventures, but we was always kind. Some bad choices in high school led to him dropping out, but after two months doing manual labor on the dry docks in the hot Alabama sun, he returned to school. He began working in IT at Domino’s twenty years ago and has worked his way up to Vice-President of Technology. He’s been married for 23 years to a woman he clearly adores. Today, Lee is the only connection I have to my father’s family. There was an argument shortly after he died, and my mother and I drove away from my father’s house with two antique phonographs and his beloved tweed jacket. I didn’t return to the house until my grandmother’s death. It was then that my aunt returned my father’s things: trunks filled with my childhood artwork, car catalogues, yearbooks, and mementos from Vietnam. Most was moldy and water damaged from years of being in an old storage room. I loaded it up and spent two days sorting through it, burning most of it in my mother’s backyard. Over the years a gift would occasionally show up at our doorstep. There was a Christmas card one year that simply said, “Call your grandmother.” Once, while in high school, I saw her in WalMart, but unsure of what to say, I slipped quickly to another aisle. My relationship with my cousins was sacrificed in the process. People who I saw every weekend, who helped shape and define my childhood, all but disappeared. As an adult Lee made an effort to stay in touch, which I have always appreciated. We meet for lunch in Ocean Springs, Mississippi. He’s a generous, good-natured guy with a big smile. Even though we haven’t seen each other in 8 years, being with him feels easy. We spend time catching up, but the conversation shifts from the present to the past. We talk about our grandparents and how they shaped our parents. When you walked into our grandparent’s house there were no pictures, no family portraits or graduation photos. The only picture I’ve ever seen of my father as a child was in his yearbook. My grandfather was a stoic man who had little to say. He would sit in his chair every afternoon eating cottage cheese and an apple, which he peeled with a pocketknife. Patience was rewarded with a slice. He was a genius and highly regarded by friends and co-workers. But as Lee and I exchange stories, piecing together information, we quietly acknowledge that that he was not always a kind man. We are resigned to the fact that certain truths have been lost over time. We each have stories that we’ve heard, little glimpses into the pieces of their lives we never witnessed. We talk about our family, who they were and who we perceived them to be. Even as we talk about the good and the bad, it’s clear that he loves them unconditionally; I respect him for that. Lunch is over and we vow to stay in touch; we can't let another 8 years pass without getting together. Sometimes at bedtime my daughter asks me to tell her stories from my childhood. It's important for her to meet the characters in those stories. It’s easy to take family for granted when they are around, but with my dad gone, I feel the need to make sure she, too, knows where she came from. Later we exchange emails, thanking one another for the time together and recalling our conversation. 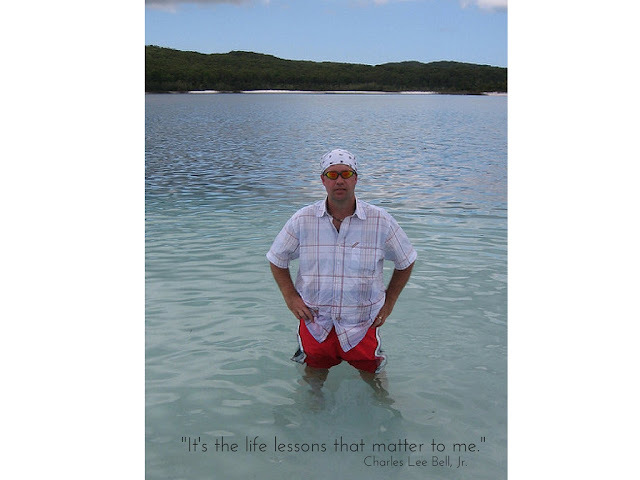 He tells me, "It's the life lessons that matter to me." Have you enjoyed 40 Lunches? Feel free to share with a friend. Like 40 Lunches on Facebook and follow along. This is absolutely lovely. I had tears at the end when you spoke of sharing with your daughter. Much of my family history is lost or forgotten. I know I will share as much of my story as I can with my daughter when she gets older. Thank you for the beautiful words! Thank you for sharing! I feel very fortunate that I still have my cousin who shares the same history. There are a lot of reasons we leave family behind. Regardless of the reason, I think there's always a little sadness. Oh, I hope that at some point you can build a relationship with them. Your story is so moving! It is so easy to let family slip away as we get busy with our new families! My daughter loves to hear stories of my childhood too and I hope she can meet all of my cousins someday even though that would be one epic trip since they are all over the place.